It's from amazon.com, and everything looks okay. But a free $50 looks too good to be true. Should I get this card for the $50? Why and/or why not? These kinds of credit card offers are incredibly common. More often you will get a certain reward if you spend $X within Y days of getting the card. In many cases you can take advantage of them with very little downside. However, are you responsible enough to have a credit card and be able to pay off the balance every month? If not the interest charges could quickly wipe out the $50 bonus you get. And hard inquiries and new accounts could potentially affect your credit score, particularly if you don't have a well-established credit history. There's also the chance you get denied in which case you add a hard inquiry to your credit report for no gain. What's going on here is that Amazon/visa thinks that the money they will earn on average from irresponsible credit card users is more value than 50$ each. This is the same logic that is behind the cash back or airplane point bonuses many credit cards offer, or the "apply and get a free 2-liter of soda" that some stores offer. I would need more information about the card to say whether or not you should apply (What are the fees, if any? What is the interest rate? etc). The most likely reason for this card is that Amazon has an arrangement with the issuer (I believe that that used to be Chase; may have changed since). Such an arrangement may allow Amazon to take the risk of chargebacks, etc. in return for the issuer handling the mechanics of billing. This is advantageous for Amazon, as otherwise they are subject to both their own procedures and those of the issuer. Amazon would rather take the entire risk than share it with someone else who charges for the privilege. Fees for processing credit cards can be as much as 5%, although 1-2% is more typical. Due to its size, Amazon may already have negotiated fees lower than 1%. But even so, any savings they make are to their benefit. Further, now they can get a share of the fees charged to other merchants. For example, if you buy a book from Barnes & Noble (an Amazon competitor) with the Amazon card, then Amazon gets some money in return, say 1% of the transaction. If the price is the same on Amazon and at Barnes & Noble, you can actually save money with the Amazon card. 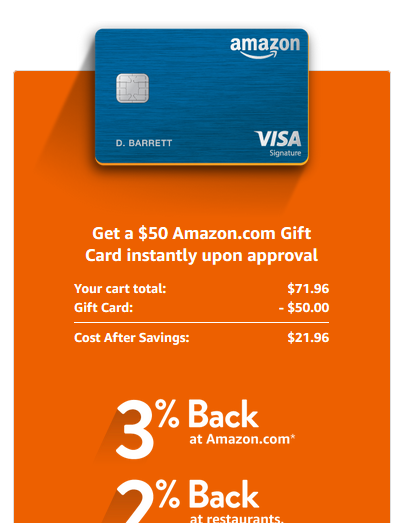 Amazon gives more "cash back" in the form of gift card balance for an Amazon purchase. So the card may mean that you buy from Amazon when you might otherwise have chosen someone else. If we again assume a 20% margin, they only need $200 of additional purchases to make $40 of profit. Someone who buys $1000 additional on the Amazon site makes them $200 of profit. They're over $160 ahead. Also note that Amazon is only giving you a gift card, which you have to use on Amazon. And it's difficult to spend exactly $50. As a practical matter, most people will buy, say, $60, with $10 of that money. So they sell you $48 of merchandise (their cost, assuming a 20% margin) for $10. They lost $38 on that transaction, but they've lured you into a long term relationship that may return more than that. And they didn't lose the $50 you gained. They only lost $38. Think about it as a marketing cost. Amazon is willing to pay $38 for a long term relationship with you. From their perspective, doing so in such a way that you come out $50 ahead (assuming you would have made the same purchases without this), is a win-win. Because once they have that relationship, they can leverage it to give them savings elsewhere. This is Amazon's approach in general. Originally all their products were drop shipped (from someone like Ingram Micro). They handled the web site and billing while the drop shipper handled inventory and shipping. Then Amazon added their own warehouses. Now they can do all that separately. Associates. Advertise Amazon products on their own web sites. Amazon pays a commission. Marketplace. Sell their own products on Amazon's web site. They handle inventory. They may also handle shipping. Or Amazon has a Fulfilled by Amazon program where sellers keep their inventory in Amazon warehouses. Amazon handles shipping and can ship in the same box with Amazon products or other Fulfilled by Amazon products. Basic fulfillment. Sell separately from Amazon, but the inventory is stored at Amazon and Amazon ships it. Amazon Payments. Amazon handles the credit card billing for transactions that occur off-site. This is just the same thing for buyers. Amazon manages all the risk of the transaction and thus gets all the profit. Because Amazon is managing the credit card risk, they have access to all the credit history. This helps them better determine if that sudden shipment of a $2000 camera to Thailand is a real transaction (you're a photographer who regularly vacations in Thailand) or a fake (you've never been to Thailand in your life and your phone is camera enough). That additional information may itself be worth enough to make the relationship profitable for Amazon. Amazon certainly gets something out of the relationship. You give them money. And you are likely to give them more money with the Amazon card than they would otherwise receive. But you get products in return. Is that a good deal? If you prefer having the products to the money, then yes. Others have suggested that it's the irresponsible credit card users that generate the real profit. I disagree. They generate more revenue in the short term, but then they overspend and declare bankruptcy. Then Amazon loses its money. Yes, they get more interest and fees in that case, but if they lose $1000, they needed to make $1000 in profit just to break even. It's safer to make the smaller short term profits with responsible customers who will continue to be customers for the long term. A steady profit of $100 or $200 a year is better than a one time profit of $500 followed by a loss of $1000 followed by nothing for ten years. Anyway, your question was if you should sign up for the card. If you are planning on doing a lot of shopping on Amazon, you might as well. It gives you cash back. If shopping on Amazon is inconvenient, then perhaps that outweighs the advantage of the card. The "cash back" is just Amazon money. You can't spend it anywhere but Amazon. If each transaction gives you a little bit of Amazon money, you have to keep going back to spend it. Every financial services company (and cellphone provider, cable and broadband provider, private energy supplier, and so on and so forth - it's turtles all the way down in a market economy) spends "something" to acquire a new customer. Paying attractive college students minimum wage to hand out brochures and branded fidget toys costs money. A 1 million piece postal mailing for a 1% response rate costs money. A TV ad or billboard costs money. A signup enticement of cash or airplane miles costs money. The question is, what does an organization spend per new customer? The amount a company wants to spend has to do with their medium term outlook and overall margins, so it will vary with the business cycle, but a rule of thumb is $100-200 spent for each customer who signs up. The advantage to this particular offer is that it may involve some payments to Amazon, but it includes less labor or cost-per-wasted-contact than alternatives. So there's more in the budget to entice the prospect. Recall, it's a one-time cost, and you gain a relationship where you get 2% of credit processing turnover for the duration of the account; a chance at 19.99% APR financing or other fees; and an opportunity to upsell a mortgage or life insurance or IRA accounts, etc to a known customer. The 'store card' that Amazon offers gives 5% back on Amazon purchases. Some time ago, when I realized how much of my spending was going through Amazon, I chose that card over this one. If you want the card, that's fine, but if you are going to play the reward game, there are far higher bonuses available for card signups. No, it's not a scam. Many stores will offer a discount at the register the day you sign up for there card. In general, the store cards should also give a discount when used at that store, or airline for that matter. Amazon has 2 different cards you can apply for, a store card and a credit card. The credit card is through Chase. The deal is not a scam, I can confirm this because I applied for their credit card and got $70 in the form of a digital gift card. By giving customers free money for signing up for their cards they get more people who are willing to give it a try. Once you have a card, you get benefits like 3-5 percent back on Amazon purchases that will entice consumers to use the card. Amazon likely has an agreement with Chase and they are hoping to get you hooked with the free money and benefits. No. Amazon is a reputable company. Many stores have their own credit card. Additionally they have several cards available, through Visa and Discover. Neither would allow their name to be used knowing that a company was using it to scam people. And credit card companies are used to going after people with the full force of the law on their side. It's the only way they stay in business. I would read the terms and conditions, but as is, it is not a scam. But a free $50 seems to good to be true. Nothing is free. Having their credit card is significant. Look into the ownership of a credit card and how credit card companies make money. And "gift cards for credit cards" are common. In fact, some companies give away money just to fill out an application even if you turn down the card. It's not a scam. They just want you to be an Amazon customer for many years and you'll be advertising Amazon to anyone who sees your credit card. $50 is known as the cost of "customer acquisition" and it is a very good deal for someone who may become a Prime member and spend $1000s a year on Amazon. a free $50 looks too good to be true. As others already pointed out, these offers are common to many cards that want you to build loyalty towards a particular company (e.g. airlines cards give lots of mileage for a decent initial spend). How much do you spend on Amazon, or are planning to do so in future? This offer has been around for ages (earlier they used to offer much smaller amounts of $20 for signing up) and you never saw it. So probably, you won't be really using the site frequently. In that case, its just a matter of whether $50 is worth the hassle for you to sign up and then later cancel (if you don't want to manage another new card). The hit to credit score is likely to be minimal unless you do such offers often. If however, you are a regular shopper but just never noticed this prompt earlier; then it is worthwhile to get this - or even consider the Prime version, which you will get or be automatically upgraded to if the account has Prime membership. That gives 5% back instead of 3% on Amazon. Based on my personal experience with that particular offer, I can say that it's not really a scam. I signed up for an Amazon Credit Card to get $70 off a purchase, but then never used the card. In fact, I never even called to activate it! After a few months, I then called to cancel it. I did not see a significant hit to my credit. However if you do shop frequently at Amazon it may be in your best interest to use their card, because it has other discounts associated with it. You get the gift card and never (fully) cash it out, so it costs them less than $50. You get the card and use it a lot, let's say $20k/year. Amazon makes perhaps 1% of those transactions, $200/year in perpetuity. You use the card and miss a payment or start paying interest, and they then very rapidly collect much more than $50 in interest. Because it has a higher rewards tier at Amazon.com it tends to both psychologically and financially nudge you towards buying there rather than elsewhere. They see your purchase records which is valuable marketing and credit-risk information, especially to Amazon. Yes you think it is on the item you are trying to purchase and they then tell you it takes X amount of time to process your card. Amazon Visa. Not the answer you're looking for? Browse other questions tagged scams websites or ask your own question. Is InitiativeQ just another scam?